Give us a call for air conditioning repair services in Huntersville, NC that won’t make you lose your cool! It is not unusual to panic when you suddenly realize that your air conditioning is not working. You envision a hefty air conditioning repair bill or even the need to replace one of the components. In reality, there are many things that can go wrong that are more affordable than you fear. Rather than spend time fretting and waiting on a service tech, give us a call at Cool Comfort Heating & Air in Huntersville, NC. We respond swiftly,and because our trucks are well-stocked, we can often get you up and running again so quickly and affordably that you can get on with the other tasks in your day without much down time. 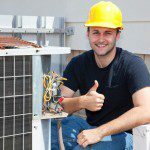 One of the things that you can count on with our air conditioning repair services is that our 15+ years of experience has taught us to look for the simple things first, thus saving time. For example, instead of looking over all the various electronics in your system because it won’t turn on, we start with making sure it isn’t a fuse or tripped breaker. Other simple things we often find include a faulty thermostat, incorrectly set thermostat, dirty or blocked evaporator or condenser, refrigerant leaks or lose wires. Even if we find that your system has completely failed, we can help make the burden less for you through various financing options. In fact, these options can make it a wise move even if your unit has not yet failed, since the energy efficiency of a newer and better unit may save you enough in utilities to cover much if not all of the finance payment. If this interests you and you would like more information, let us know, and we can run an analysis for you. Give us a call for air conditioning repair services that won’t make you lose your cool! We are available 24/7 for emergencies, so you don’t have to swelter any longer than necessary.